In another demonstration of excellence and quality advocacy’s spread across all the regions in the Philippines, the Dipolog School of Fisheries (DSF) has undergone a two-day accreditation exercise in which the team from the Asia-Pacific Accreditation and Certification Commission (APACC) validated and examined the institution’s practices and standards in compliance with the accepted international benchmarks. 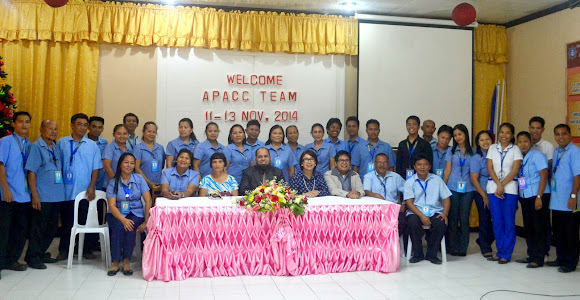 The team composed of Dr. Hazrat Hussain (Team Leader), Dr. Theresita Atienza (team member) and Mr. Rae Emmanuel Echaveria (APACC Staff) visited the institution from November 12 to 13, 2014. The onsite visit was the second of its kind in the Zamboanga Peninsula region after the Kabasalan Institute of Technology (KIT), which was visited by APACC in 2011. The Dipolog School of Fisheries, located in Brgy. Olingan, Dipolog City, Zamboanga del Norte was created when the Republic Act 2635 passed and approved by the defunct Congress of the Philippines on June 18, 1960. It was transferred to TESDA through the Special Provision No. 19 of the 1997 General Appropriation Act which provides for the phase out and transfer of secondary programs in TESDA Administered Schools of the Department of Education, Culture and Sports. Currently, the institution is headed by the Vocational School Administrator, Mrs. Rosella Darcera. Its vision is to become a world-class fishery and allied sciences training institution and the provider of highly competitive skills and it plans to fulfill that mission by developing graduates with high competence and skills in fisheries and allied sciences through quality assured training programs and positive work values. The opening ceremony, held on November 12, 2014, was attended by all DSF Faculty and Staff and was graced by the Provincial Director of TESDA Zamboanga del Norte, Director Nilda C. Espiritusanto. She cited the relevance of this activity in fostering a culture of excellence in education among the Dipolognons. A presentation of the members and focal persons per APACC committee, as well as the schedule, were also held. The accreditation team went around the competency areas and offices, particularly the food processing plant where they process their canned herring and milkfish (bangus) for export to other places. They also observed institutional practices and workshops currently being held at the institution. The institution was evaluated based on their self-study report covering seven areas namely: (1) Governance and Management; (2) Teaching and Learning; (3) Faculty and Staff; (4) Research and Development; (5) Extension, Consultancy and Linkages; (6) Resources and (7) Support to Students. Evidences in the form of documents, recordings, logs and other proof were presented by the institution.